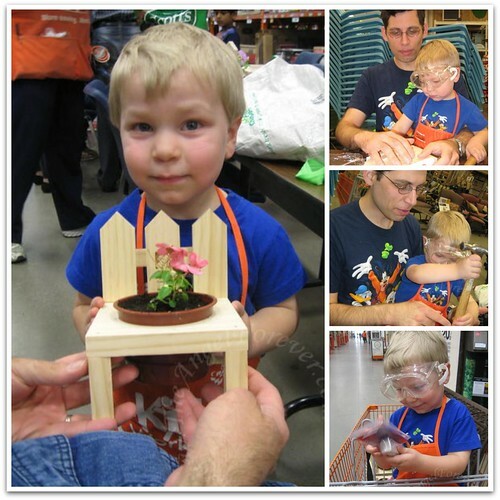 It has been a while since we all went to Home Depot for their free Kids Workshop. We thought it would be a nice treat for the two of you to go and make something. 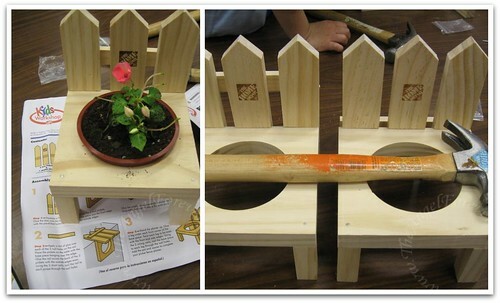 Today, they had picket fence planters for kids to make and take with them. Papa met us there to watch and keep us company. Today was a special day for you JSL. 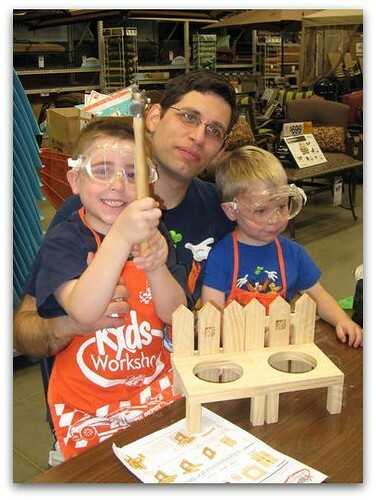 Even though you are probably too little, we decided to let you "build" one with Daddy. You had a lot of fun banging with the hammer. Of course, I think your favorite part may have been wearing your Home Depot apron and goggles that we brought with us. When we were done with the project and shopping around the store, you refused to take everything off and rode around just like that. NHL, you really liked this project as well. You wanted to do things on your own, but I tried to help you out. Of course, I messed up on something when I was trying to take photos at the same time. Daddy and I quickly told you it was so we could tell your planter apart from JSL’s. . . which technically is true. When it was time to get your plants, the always friendly Melissa allowed NHL to pick out the flowers. You picked purple and asked for a pink one for JSL. In the end, we had a wonderful time. Next week, they are doing something new and we will try to go again. If not, I hope we can go next month to make the soccer game. It has been so much fun watching both of you build things together. .-= RobMonroe´s last blog ..Menu Monday =-. 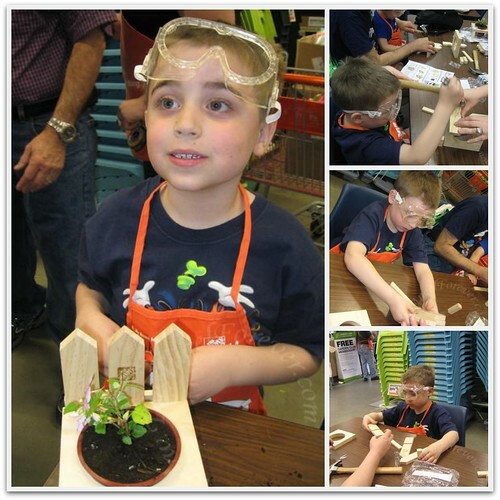 We did the Kids Workshop once and the boys loved it, but we always forget about them too. Too bad we missed this last one, Alex would have LOVED that! I’ll have to put it in my Google calendar as a reminder. Looks like the boys really had fun. .-= Nancy´s last blog ..Daybook: May 2 =-.